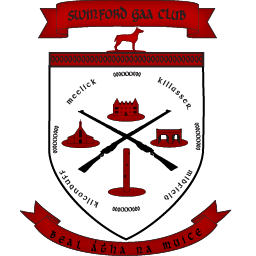 Swinford GAA Club are proud to announce details of the official reopening of our new all-weather Pitch. On Sunday 6th May we will dedicate our pitch in memory of Garda Robert Mc Callion. Robert was a proud and very active member of our club. In the course of his Duty as a Garda, he was tragically killed in April 2009. We beleive that it is proper and fitting to honour his memory in this way. We intend to make this reopening a day of celebration for our club and our community. The day will commence with a game between Swinford and a Garda Selection at 12.30pm. The main highlight will be an Inter County challenge match between Connacht Champions Mayo and Ulster Champions Donegal at 2.30pm. The official reopening ceremony will be performed by former Swinford and Mayo great Dr. Padraig Carney at 2.00pm. Dr. Padraig known as ” The Flying Doc ” will be travelling from California for the occasion. We wish to invite all those within the Mayo Football Community and the local community to come along and enjoy the days matches and celebrations with us.